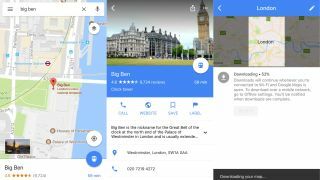 Google Assistant is finally coming to Google Maps, with an update to the popular navigation app being rolled out now to users across the world. The update, which will be available to iOS and Android users, means you'll be able to control navigation with your voice, making it easier than ever to navigate hands-free. Not only that, but the integration means you can also respond to texts using your voice, complete with 'auto-punctuation', and control your music. Predictably, Android users will be able to get their hands on a few more features than iOS users, including sending messages via Whatsapp, Google Hangouts, Facebook Messenger, Telegram, Viber, and other third-party messaging applications. Although Android users will get the most out of Google Assistant's integration into Maps, it looks like Google is squarely targeting iOS users, in a bid to lure them away from Apple's own voice assistant Siri. In the past, iOS users had to download Google Assistant separately from the app store – now, the voice assistant will be built in to an app that over 70% of smartphone owners use. The news of the update comes just one week after Google began adding instant messaging capabilities to the app, with some users discovering a new 'Messages' menu item in what appears to be a test of the new feature. So it looks like Google is working hard to make Google Maps even more attractive to its enormous user base, and we could even see that large percentage of smartphone owners who use the popular navigation app rise even further as a result.